When I reached home after work, there was a surprise box sitting at our front door delivered by UPS. I knew that it was something my hubby would have ordered. Kids were excited, but they knew that it was not their XBOX game. And I knew that it was not anything for me. So we called him at work and as soon as he heard from us that a box arrived he was thrilled. He told us not to open it and it was something for him and instructed us to keep it on the kitchen counter. He told me that he was getting some detox item online, and my notion was it was some kind of powder and so never expected a big box. Later when he reached home, we gathered around the huge box just like kids gathering around a birthday cake. He opened the box carefully. To test our patience there was a silver box inside. Our eyes opened even wider due to the eagerness. Finally the ceremony of box opening happened and we saw the 18 ice cold frozen juice boxes plopping out of the insulated cover. Their packing was excellent that the juice remained frozen. He organized everything on the kitchen counter showing us like an expert and explaining that the set of 6 bottles were going to be the meal for each day and he was doing the detox diet for next 3 days. I was more eager to read the labels and the ingredients. As soon as I did my job of reading, I declared 'Oh I could have made all these for you! !’ He agreed that we could try next time. We were so eager each time he opened each bottle. Kids never came to his vicinity when it was the turn of green juices. I was like a baby opening the mouth for coke to try a sip what he was having. Tender coconut juice was the best out of the whole set. We ignored his complaints that it was his meal. On top of our meal, we all got a sip of the tender coconut juice with the flesh leaving less juice for my poor hubby...lol. Anyways that was the inspiration for this post. 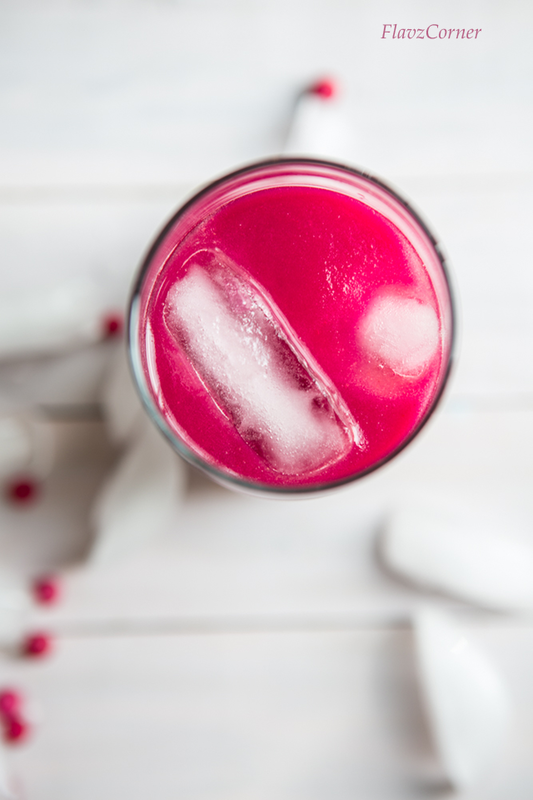 The earthy taste of beets is balanced by the lemon juice and ginger. Juicing fresh vegetables and fruits helps to keep the enzymes, antioxidants and other nutrients intact. Our body can absorb the nutrients quickly, so it helps in detoxing the body with raw juices. 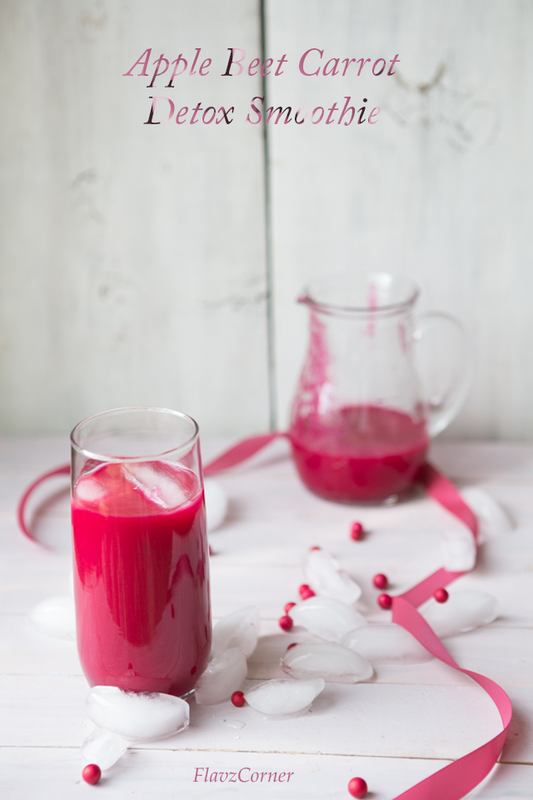 The beets carrots juice is supposed to detox your liver and gallbladder. Raw juices have the tendency to get oxidized quickly especially when we have fruits like apples added to it. To prevent the oxidation lemon juice is added. But I would recommend drinking the juice/smoothie as soon as it is prepared. Also remember that fresh juice is not a complete meal unless you are balancing the diet with a protein. This detox juice is high in sugar due to the kind of vegetables/fruits used in it. This detox juice is rich in Manganese, Potassium, Vitamin C and A. There is no cholesterol in this juice and it is very low in saturated fat. People with the kidney stone history should limit the consumption of beets. Also make sure to hydrate yourself with lot of water after taking this smoothie, otherwise you might fret by the discoloration of urine due to the pigmentation caused by beets. Hope you will try this detox smoothie!! Blend all the ingredients in a powerful blender except ice cubes. Pour into serving glass and add ice cubes and enjoy. You can strain it through a strainer if you prefer a juice, but we enjoyed with the fiber which was not even evident in the liquid, as it was blended well like a smoothie. Two apples were good enough to sweeten the detox juice, so there was no need for honey or any sweetner. Love the color of your smoothie, reminds me of the strawberry tang I used to drink as a kid. 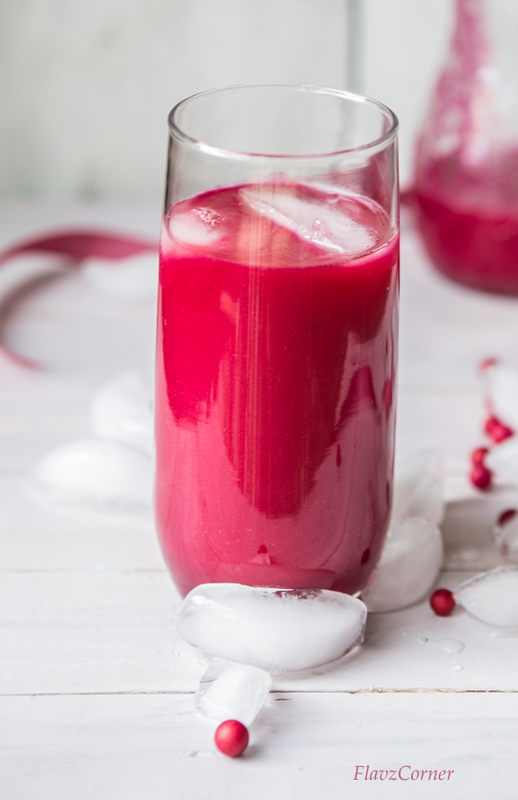 I was also skeptical about the beet juice, but trust me the lemon and ginger plays a huge role in this smoothie and it balances the earthy flavor of the beet to a great extend. No, you should not be taking this on a daily basis. As everyone knows too much of anything is not good. In the post I had explained the pros and cons of this juice. Since it is used to detox rather than a meal, you may have to fit it into your diet accordingly. Give it a try Rafeeda. I am sure you will like it. I love smoothies, and DETOX smoothies are the best. This vibrant, hearty and healthy pink color looks so gorgeous, Shibi. Gorgeous colour and flavour. I would love one too.